Download a blank fillable Dd Form 2987 - Cap Accommodation Request in PDF format just by clicking the "DOWNLOAD PDF" button. 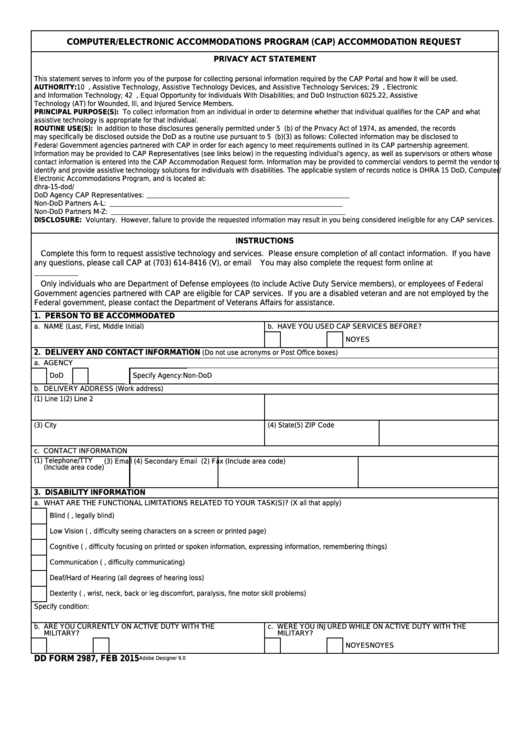 Complete Dd Form 2987 - Cap Accommodation Request with your personal data - all interactive fields are highlighted in places where you should type, access drop-down lists or select multiple-choice options. This statement serves to inform you of the purpose for collecting personal information required by the CAP Portal and how it will be used. Technology (AT) for Wounded, Ill, and Injured Service Members. assistive technology is appropriate for that individual. Federal Government agencies partnered with CAP in order for each agency to meet requirements outlined in its CAP partnership agreement. Federal government, please contact the Department of Veterans Affairs for assistance. b. HAVE YOU USED CAP SERVICES BEFORE? b. ARE YOU CURRENTLY ON ACTIVE DUTY WITH THE U.S.
c. WERE YOU INJURED WHILE ON ACTIVE DUTY WITH THE U.S.